Walk through a grove of giant bamboo in Savannah. The oldest bamboo plants in Georgia – and quite possibly the United States – are located about 20 minutes southeast of our Savannah Vacation Rentals. They’re part of the Bamboo Farm and Coastal Gardens, which is believed to contain the largest and most varied collection of bamboo on the continent. It is a marvelous place to visit. 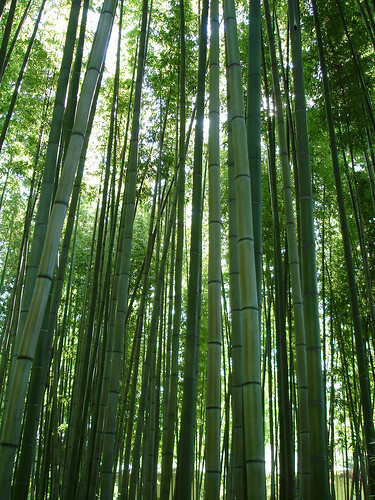 The first bamboo plants arrived in Savannah around 1890. Three clumps of Vallambrosa giant timber bamboo were planted by the farmhouse of Mrs. Smith; fifteen years later they had grown to a height of 50 or 60 feet and spread out over three quarters of an acre. In short, the bamboo thrived. This impressive bamboo grove has been close to destruction several times over the years, and several times it has been saved. Since the mid 1990s (a good century after its beginnings), the bamboo farm has been under the stewardship of the University of Georgia. It is currently maintained by a host of students, faculty, and volunteers. Today the Bamboo Farm and Coastal Gardens is home to many plant varieties, not just bamboo. There are strawberry fields, blueberry patches, an organic garden and a sugar cane patch. There is a banana research plot, a crape myrtle collection, and a lovely section filled with hedge bamboo. Flowers are planted throughout the gardens for color: irises, camellias, and azaleas flourish. Yet it is the giant bamboo that is most impressive to behold. When you walk among the it, you feel as if you are in a completely different country. The Bamboo Farm and Coastal Gardens is open daily, except holidays. It is a beautiful place to walk and enjoy a picnic. It is also quite picturesque. If you are hosting your Savannah Destination Wedding at one of our Savannah Vacation Rentals, you may find some stellar photo opportunities at the Bamboo Farm and Coastal Gardens. For more information, please visit the Bamboo Farm and Coastal Gardens website.